For Use as a Manufacturing Component in Production of Stem Cell Therapies. Not Approved for Direct Human Use. Our highly purified recombinant human platelet-derived growth factor BB (rhPDGF-BB) is a potent stimulator of the proliferation and recruitment of mesenchymal stem cells (MSC). These cells grown using our rhPDGF-BB are being used successfully in cell therapies under development by our corporate partners. Contact us for purchasing information. Platelet-derived growth factor (rhPDGF-BB) is one of numerous growth factors that regulate cell growth and division. 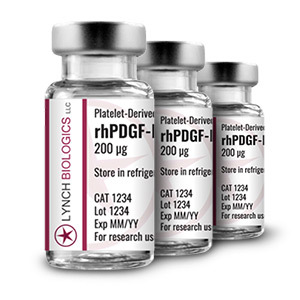 In particular, rhPDGF-BB plays a significant role in blood vessel formation (angiogenesis), the growth of blood vessels from already-existing blood vessel tissue, mitogenesis, i.e. proliferation, of mesenchymal cells such as fibroblasts, osteoblasts, tenocytes, vascular smooth muscle cells, Schwann cells, glial cells, mesangial cells, pericytes and mesenchymal stem cells (MSCs) as well as chemotaxis, the directed migration, of these mesenchymal cells. 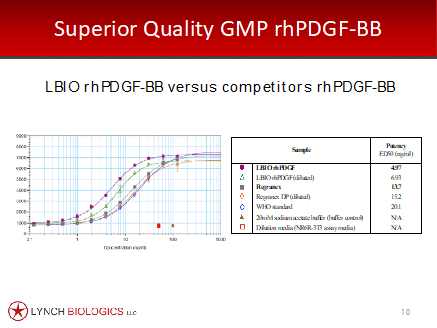 Naturally occurring rhPDGF-BB is a dimeric glycoprotein that can be composed of two A subunits (PDGF-AA), two B subunits (PDGF-BB), one of each (PDGF-AB), two C subunits (PDGF-CC) or two D subunits (PDGF-DD). PDGFs are stored in platelet α-granules, and are released upon platelet activation. They are also produced by endothelial cells, smooth muscle cells, activated macrophages, and some activate epithelial cells. Two distinct signaling receptors used by PDGFs are named PDGFR-α and PDGFR-β. rhPDGF-BB is a 24.3 kDa disulfide-linked homodimer of two β chains (218 total amino acids). rhPDGF-BB is a mitogenic and chemotactic for fibroblasts, osteoblasts, tenocytes, periodontal ligament cells, dental pulp derived cells, vascular smooth muscle cells, Schwann cells, glial cells, mesangial cells, pericytes and mesenchymal stem cells (MSCs). rhPDGF-BB is an important modulator of many biological processes, including dermal wound healing, bone regeneration, embryonic neuron development and respiratory tubule epithelial cell development. Medical applications of rhPDGF-BB have been evaluated extensively. It is the active component of three FDA-approved products: GEM 21S; AUGMENT Bone Graft; and Regranex Gel. 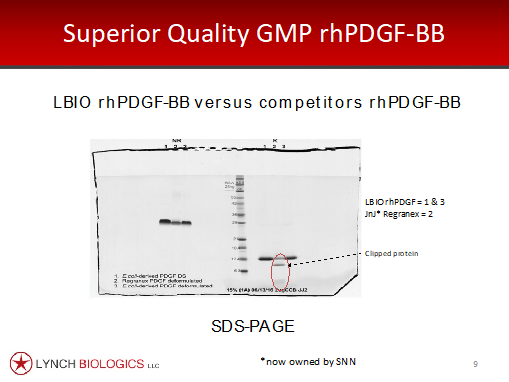 Purity: Greater than 98% by SDS-PAGE gel and HPLC analysis. Tested: Extensive testing has been performed demonstrating our rhPDGF-BB stimulates rapid expansions of MSC’s in large scale manufacturing and preserves their phenotype for therapeutic use. Lynch SE, Nixon JN, Colvin RB, and Antoniades HN. The role of platelet-derived growth factor in wound healing: Synergistic effects with other growth factors. Proc Natl Acad Sci USA 1987;84:7696-7700. Lynch SE, Colvin RB, and Antoniades HN. Growth factors in wound healing: Single and synergistic effects on partial thickness porcine skin wounds. J Clin Invest 1989;84:640-646. Lynch SE, Williams RC, Polson AM, Howell TH, Reddy MS, Zappa UE, and Antoniades HN. A combination of platelet-derived and insulin-like growth factors enhances periodontal regeneration. J Clin Periodontol 1989;16:545-548. Lynch SE, Ruiz de Castilla G, Williams RC, Kiritsy CP, Howell TH, Reddy MS, Antoniades HN. The effects of short term application of a combination of platelet-derived and insulin-like growth factors on periodontal wound healing. J Periodontol 1991; 62:458-467. Antoniades HN, Galanopoulos T, Neville- Golden, Kiritsy CP, Lynch SE. Injury induces in vivo expression of platelet-derived growth factor (rhPDGF-BB) and rhPDGF-BB receptor mRNAs in skin epithelial cells and rhPDGF-BB mRNA in connective tissue fibroblasts. Proc Natl Acad Sci USA 1991;88:565-569. Antoniades HN, Galanopoulos T, Neville-Golden J, Kiritsy CP and Lynch SE. Expression of growth factor and receptor mRNA in skin epithelial cells following acute cutaneous injury. Am. J. Pathol 1993; 142:1099-1110. Cochran DL, Rouse CA, Lynch SE and Graves DT. Effects of platelet-derived growth factor isoforms on calcium release from neonatal mouse calvariae. Bone 1993; 14:53-58. Kiritsy CP and Lynch SE. The role of growth factors in cutaneous wound healing: A review. Critical Rev Oral Biology & Med 1993; 4:729-760. Nevins M, Camelo M, Nevins ML, Schenk R, Lynch SE. Periodontal regeneration in humans using recombinant human platelet-derived growth factor BB (rhPDGF-BB) and allogenic bone. J Periodontol 2003; 74:1282-1292. Camelo M, Nevins ML, Schenk RK, Lynch SE, Nevins M. Periondontal regeneration in human Class II furcations using purified recombinant human platelet-derived growth factor-BB (rhPDGF) with bone allograft. Int J Periodontics Restorative Dent 2003; 23:213-25. Nevins M, Giannobile W, McGuire M…Lynch SE. Platelet-derived growth factor stimulates bone fill and rate of attachment level gain: Results of a large multicenter randomized controlled trial. J Periodontol 2005;76:2205-2215. Lynch SE. Bone regeneration techniques in the orofacial region. In Bone Regeneration and Repair: Biology and Clinical Applications. Lieberman JR and Friedlaender GE, Eds. Humana Press, 2005; 359-390. Lynch SE, Marx RE, Nevins M and Wisner-Lynch L. (Eds.) Tissue Engineering: Applications in Maxillofacial Surgery and Periodontics: Second Edition. 2008. Quintessence Publishing Co., Hanover Park, IL. pp 1-296. Hollinger J, Hart C, Hirsch S, Lynch S, Friedlaender G. Recombinant Human Platelet Derived Growth Factor: Biology and Clinical Applications. J Bone & Joint Surgery, 2008; 90:48-54. Hollinger J, Onikepe A, MacKrell J, Einhorn T, Bradica G, Lynch S, Hart C. Accelerated Fracture Healing in the Geriatric Osteoporotic Rat with Recombinant Human Platelet-Derived Growth Factor-BB and an Injectable Beta-Tricalcium Phosphate/Collagen Matrix. J Orthopedic Res 2008; 26:83-90. Kaigler D, Avila G, Wisner-Lynch L, Nevins Marc, Nevins Myron, Rasperini G, Lynch S, Giannobile W. Platelet-derived growth factor applications in periodontal and peri-implant bone regeneration. Expert Opinion Biol Ther. 2011 Mar;11(3):375-85. Friedlaender GE, Lin S, Solchaga LA, Snel LB, and Lynch SE. The role of recombinant human platelet-derived growth factor-BB (rhPDGF-BB) in orthopaedic bone repair and regeneration. Curr Pharm Des. [Epub ahead of print PubMed PMID: 23432673]:Volume 19, Number 19, June. 2013: 3384 – 3390. DiGiovanni CW, Lin SS, Baumhauer JF, Daniels T, Younger A, Glazebrook M, Anderson J, Anderson R, Evangelista P and Lynch SE. Recombinant Human Platelet-Derived Growth Factor-BB and Beta-Tricalcium Phosphate (rhPDGF-BB / β-TCP): An Alternative to Autogenous Bone Graft. J Bone & Joint Surgery, 2013; 95:1184-92. DiGiovanni CW, Glazebrook M, Snel LB, Beasley B, Lynch SE and Friedlaender GE. A review of the clinical experience with recombinant human platelet-derived growth factor-BB (rhPDGF-BB) in orthopaedic bone repair and regeneration. Current Orthopedic Practice, 2013.